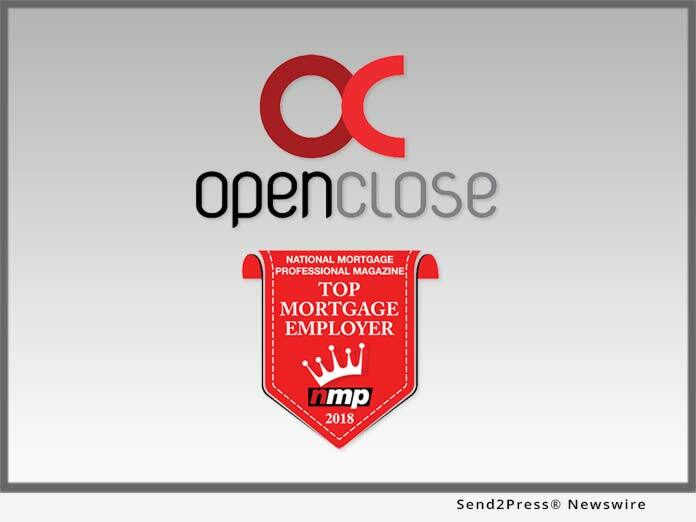 WEST PALM BEACH, Fla., Mar 09, 2018 (SEND2PRESS NEWSWIRE) -- OpenClose(R), an industry-leading multi-channel loan origination system (LOS) and mortgage fintech provider, announced that was it was again honored as a Top Mortgage Employer by National Mortgage Professional magazine (NMP) for 2018. OpenClose was one of only ten companies to be included in the Services Providers category. "To make National Mortgage Professional magazine's Top Mortgage Employers list back-to-back years is an honor that our entire company is proud of," said JP Kelly, president of OpenClose. "Providing innovative software, successful implementations and highly responsive customer support is the cornerstone of our business and industry reputation, and is the direct result of our extremely dedicated employees." OpenClose is known to hire employees that have rich backgrounds in the mortgage industry and possess both mortgage technology and also mortgage lending experience working for vendors as well as lenders. OpenClose's multi-channel LenderAssist(TM) LOS platform and robust OC Correspondent(TM) module has fueled record company growth the past few years, which resulted in the addition of new employees in nearly all functional areas within the company. OpenClose is headquartered in West Palm Beach, Florida and also has an office in Gig Harbor, Washington. Founded in 1999 and headquartered in West Palm Beach, Florida, OpenClose(R) is a leading enterprise-class, multi-channel loan origination system (LOS) and fintech provider that cost effectively delivers its platform on a software-as-a-service (SaaS) basis. The company provides a variety of innovative, 100 percent web-based solutions for lenders, banks, credit unions, and conduit aggregators. OpenClose's core solution, LenderAssist(TM), is comprehensive loan origination software that is completely engineered by OpenClose using the same code base from the ground up, thus avoiding the problems that often accompany assembling best-of-breed applications or acquiring disparate technologies in an effort to create an end-to-end platform. The company provides lending organizations with full control of their data and creates a truly seamless workflow for complete automation and compliance adherence.